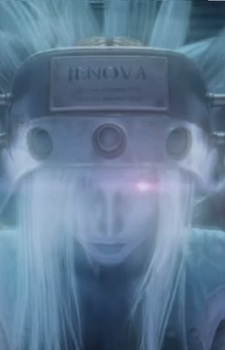 Jenova is an alien or 'extraterrestrial' being that landed on Gaia thousands of years ago. When Jenova arrived and wounded the planet, she infected the Ancients (or 'Cetra') with her cells, and through her will she transformed them into hideous, chaotic monsters. Eventually Jenova was subdued and killed for the next 2000 years by the remaining Cetra. Her cells can act as a virus if they are injected into a human, but they will be granted a certain amount of power. All members of SOLDIER were given a portion of Jenova's cells. Jenova initially takes on the appearance of a blue/purple skinned woman, however it is confirmed by Sephiroth that 'she' can take any form, and takes on the appearance of Sephiroth quite often throughout the game.